Last Sunday can probably be described as the weirdest day of the year, provided some other incident does not top the bizarre category within the next few days. We, the clueless, the ordinary citizens, trying very hard to live a somewhat normal life in this impossible city of ours, were not informed that a sudden political game was to start from the early, foggy morning of December 18. Snatches of information poured in. Cocktail bombs had exploded, cars and buses were being smashed and set to fire. Everyone was confused. Had the opposition called a hartal? Usually such 'movements' are at least reported in the news and the streets start thinning of buses and cars in apprehension of the vehicle-breaking strategy that invariably initiates a 'successful' hartal. But this time the ordinary person waiting for a bus on Saturday night, had absolutely no idea that the next day would be a day of inferno. Moqbul Hossain was such an ordinary bus passenger who had to witness one of the most horrifying scenes in his life. The bus running from Maulvi Bazar to Habiganj in Sylhet was suddenly stopped by a gang on motorcycles; the men got down from their bikes and started smashing the windows with canes and bricks, a petrol bomb was thrown in and the bus caught fire. The attackers tried to prevent the passengers from escaping but most of them managed though with severe injuries – except one. The man was trapped inside; his fellow passengers, including Moqbul, following their humane instinct to save another life, went forward to try and get him out. But the arsonists would not let them go and help him and the hapless passengers, some of whom had broken their leg while trying to escape, watched in horror and disbelief as their fellow passenger was burnt alive right before their eyes, his legs sticking out of the window. According to news reports this was a new strategy by the opposition to create enough chaos in the cities to practically paralyse them for the next few days. The move to have groups of troublemakers at key points from the early hours, had apparently been kept a secret from even some of the high ups of the party, to ensure that the surprise factor would work. The convoluted theory is that Begum Khaleda Zia was to have attended a function to honour Freedom Fighters and so the BNP thought it would be a good idea to make it look like the government was trying to foil it by attacking her supporters. Later they said that the whole thing had been created by the government to make the opposition look bad. How original! In the end nobody is really sure what happened and why. So now we have another big worry on our heads. These kind of 'movements' may spring up at any time. There may not be any announcement in the newspapers the day before. 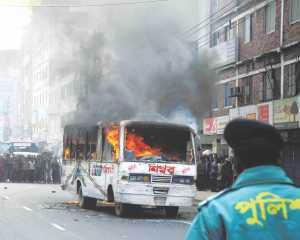 There may not be any pre-hartal bus burnings the night before. There may not be any warning whatsoever for us when we go out on the streets that we may suddenly be attacked and burnt alive. Patience is a virtue and our resilience as a nation may one day be a record breaker. But how long can we keep going despite all the abnormality around us? We are forced to endure crippling traffic jams, ridiculously long queues for a bus, hartals when no public transport except rickshaws will be available, clashes on the streets, chases and counter chases, indiscriminate police brutality, arrests, mysterious deaths and disappearances. Perhaps it is this tolerance for abuse of power that has allowed things to escalate to such levels. Being attacked and then forced to watch a fellow human being burnt alive cannot be a test on our resilient spirit. We, the helpless public, cannot accept such terrorism as part of political strategy anymore.